Click here (PDF, 2.5 MB) for the latest edition of the Camel Express, including stories and news, from and about Niger. Music with a message of peace. 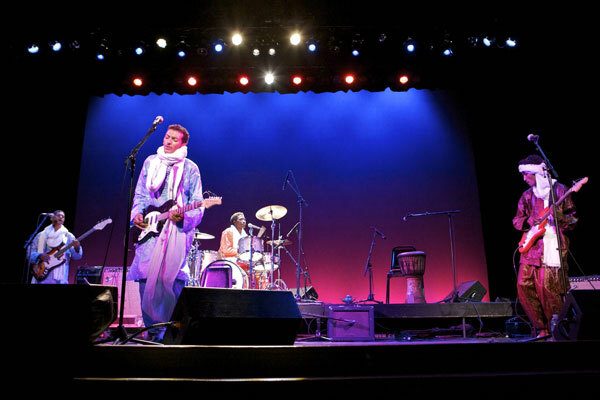 On April 5th, 300 people, along with the Ambassadors of Niger and Gabon, danced, clapped and cheered for Tuareg sensation Bombino at The Music Hall in Portsmouth, NH to support RAIN’s programs in Niger. At the reception before the performance, Portsmouth Mayor Eric Spears was on hand to deliver to Bombino and the Ambassadors a special welcome and to proclaim April 5, 2012 as West Africa Day in Portsmouth, expressing pride in the city’s role in bringing new life to RAIN’s partner nomadic communities. Representing Friends of Niger were John Hutchison and Larry Koff. 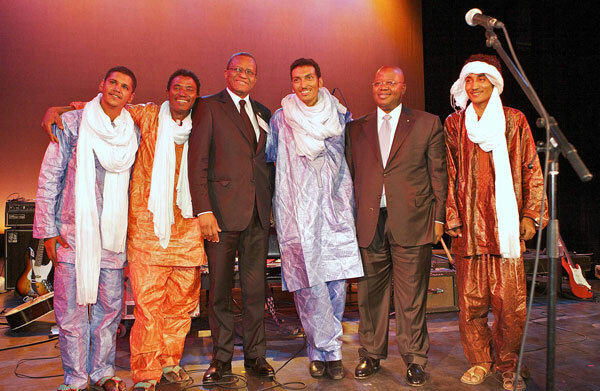 RAIN and FON have worked together to petition for Peace Corps reinstatement in Niger as well as support for NGOs in the region in Washington D.C.
During the concert, Bombino sang songs about unity and reconciliation, of the beauty of the desert and of nomadic life. He spoke to the audience about the importance of education in his homeland, sharing his plans for an upcoming Peace Tour to promote Niger as a model of peace for the West African region. The Ambassador of Niger, the Hon. Maman Sidikou, spoke of the resiliency and hope of his country. He expressed that despite recent unrest, Niger is a country of diverse people, unified in their identity as Nigeriens and in their shared goal of engagement with each other and their neighbors. He also expressed how inspired and moved he was by the huge show of support for his country demonstrated that evening by their New England friends. The air of excitement and enthusiasm was palpable as the Portsmouth audience gave Bombino and his group multiple standing ovations. As for RAIN, we couldn’t have asked for a warmer reception and are excited to share their vision of a Niger where people with access to education, food and water have the freedom to choose to live in their tradition in safety and good health with a wider circle of supporters. For more information about RAIN, visit the Rain for the Sahel and Sahara web site. Although Peace Corps’ presence in Niger is on hold at the moment, 2011 still marks 50 years of promoting peace and friendship around the world by volunteers in dozens of countries. The National Peace Corps Association is coordinating all kinds of events throughout 2011 to honor the past and inspire the next generation of volunteers. Come check out the calendar of events to find some near you.